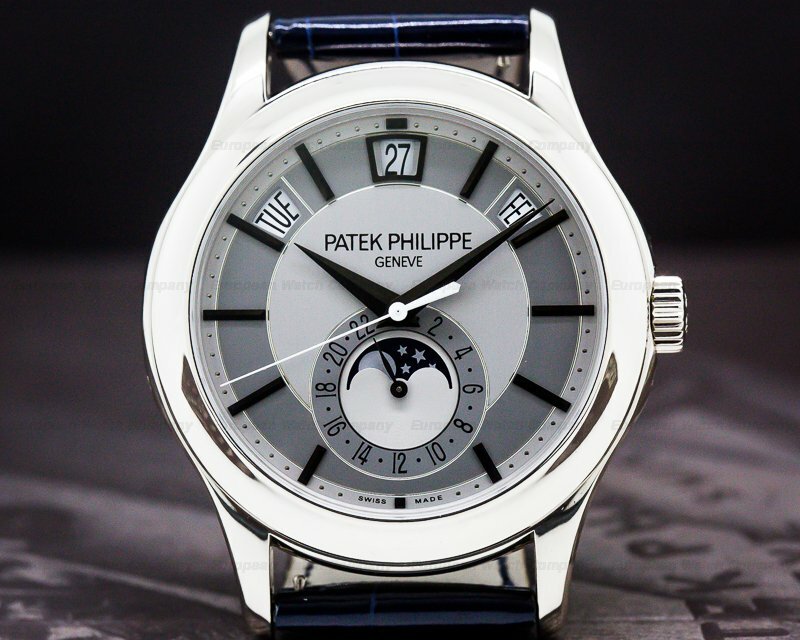 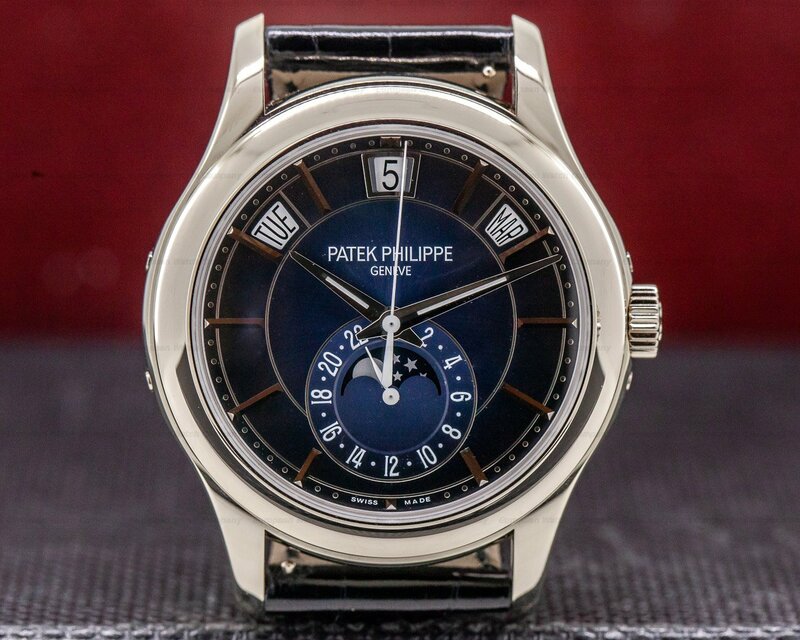 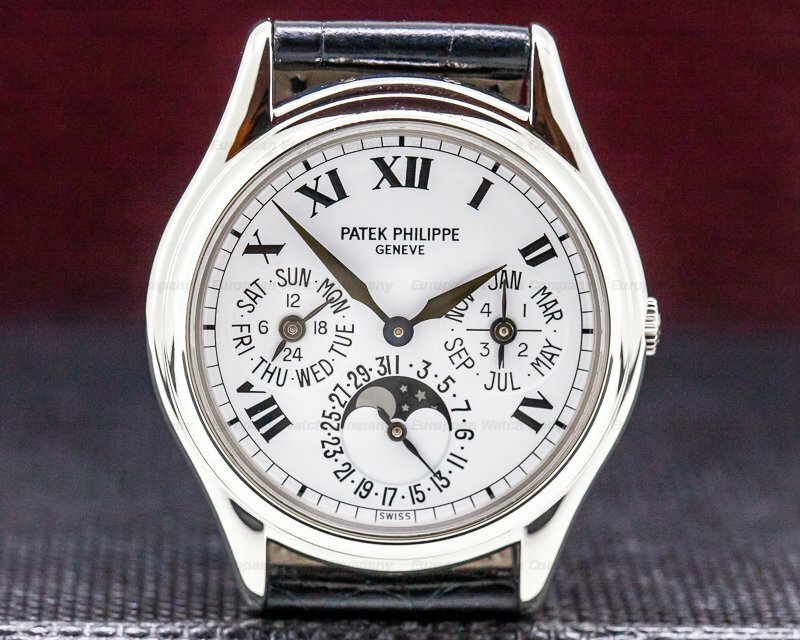 This is an 18K white gold Patek Philippe Annual Calendar 5205G-013. 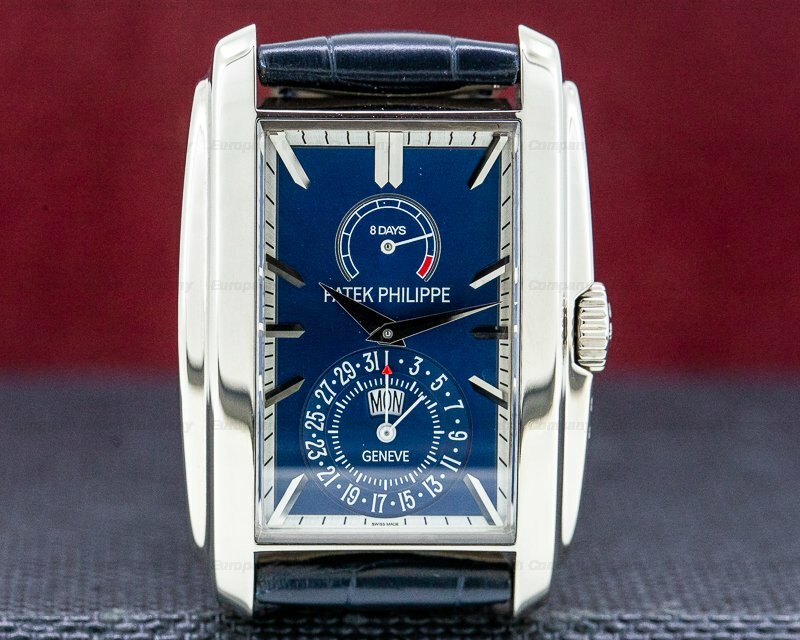 It has a leather strap with an 18K white gold tang buckle, and scratch resistant sapphire crystals. 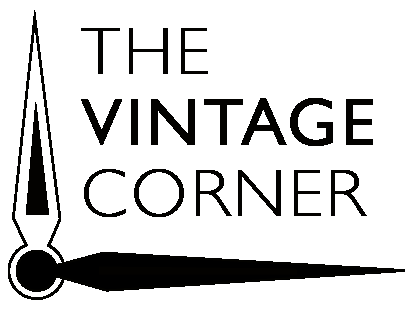 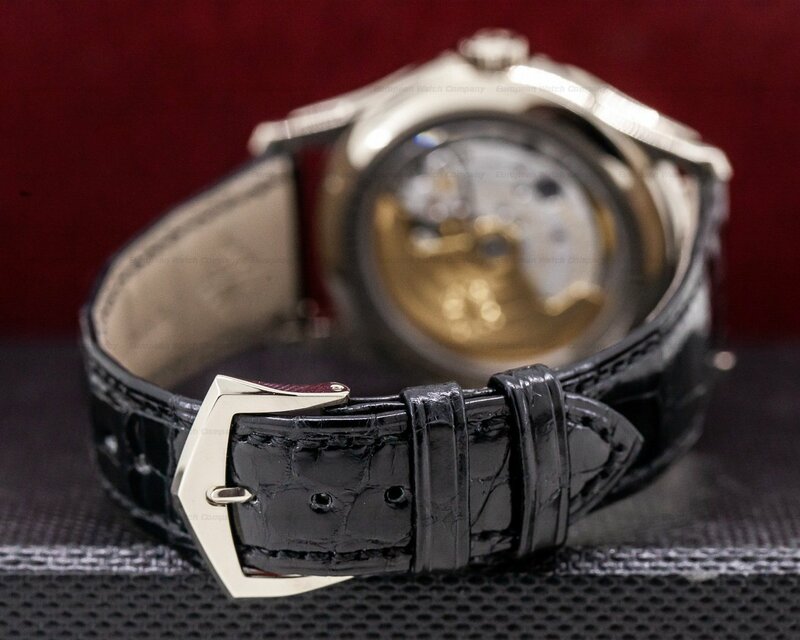 It includes a screw down winding crown braced by two correctors in the right-side case band, and two more in the left side case band for adjusting the annual calendar functions. 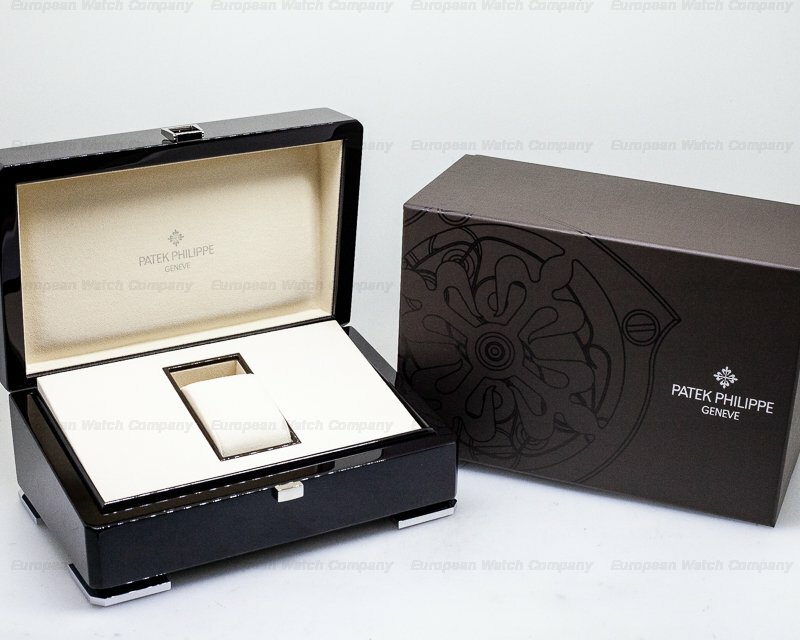 There is a snap down exhibition sapphire display case back, and the 40mm diameter solid two-body case, rounded bezel, and skeletonized lugs are all polished. 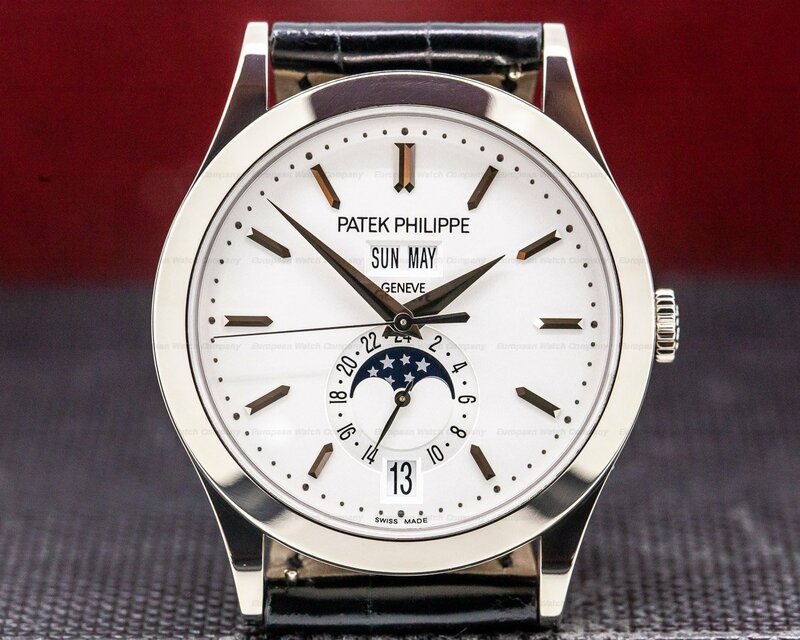 The dial has gradiant blues with polished white gold dauphine hands with luminous inserts, and a luminous white center sweep seconds hand. 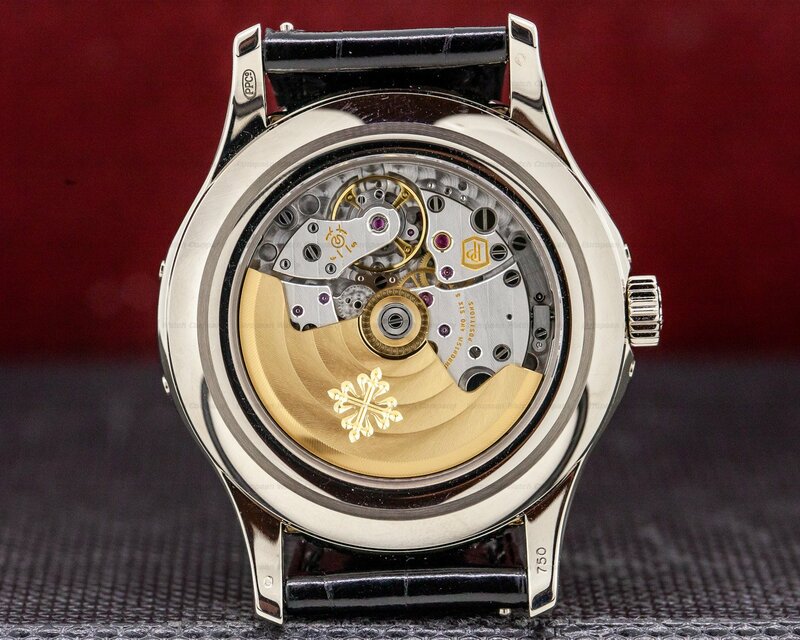 It has thin concentric white gold rings with applied faceted white gold hour indices around a perimeter gold pip minute/seconds scale. 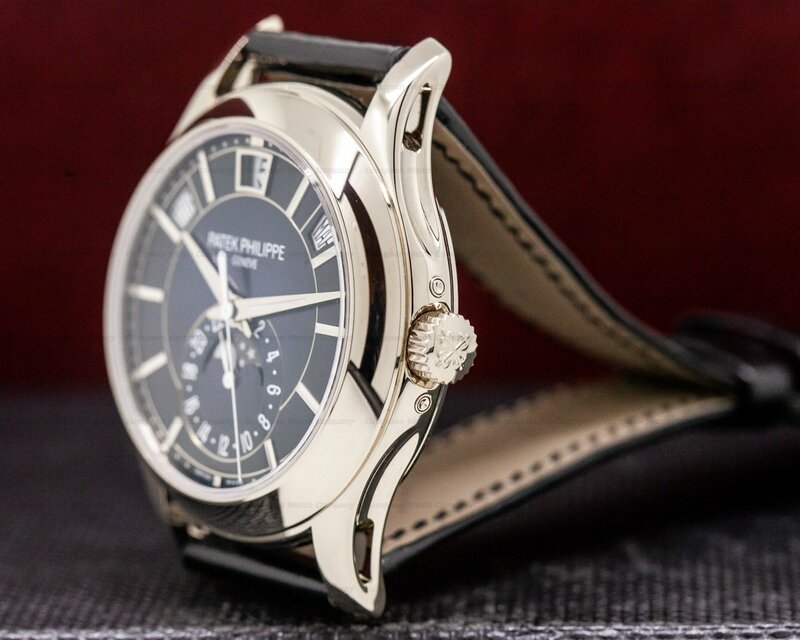 There are three trapezoidal aperture windows, including a day window at 10 o'clock, a date register at 12 o'clock, and the month is at 2 o'clock. 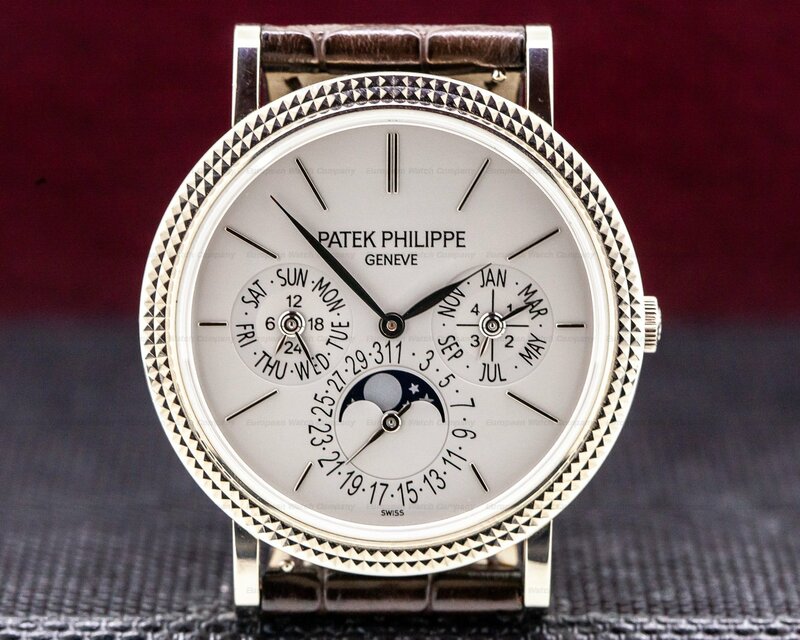 A large white gold ringed combination 24-hour indicator/moon phase is at 6 o'clock, with luminous white Arabic hour markers and a white indicator hand. 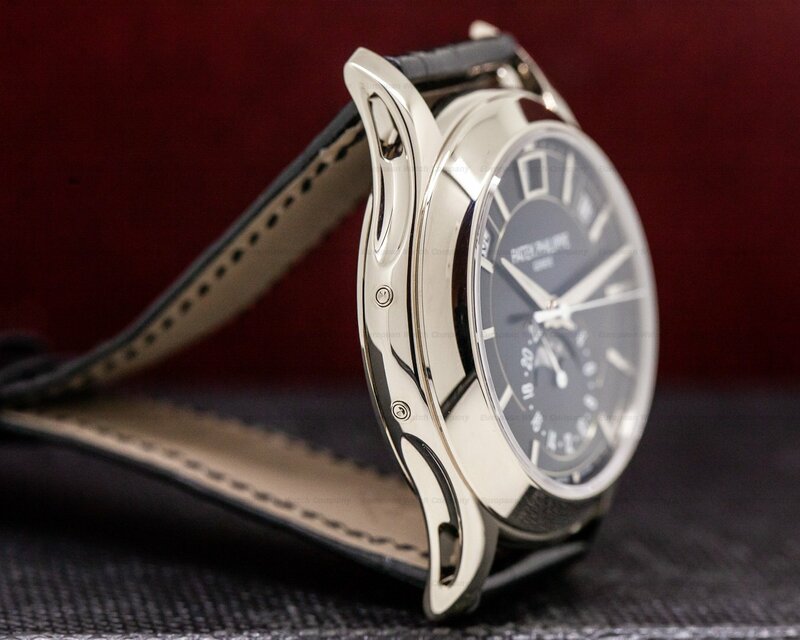 It has a 45-hour power reserve at full wind, and it's water resistant to 30 meters/100 feet. 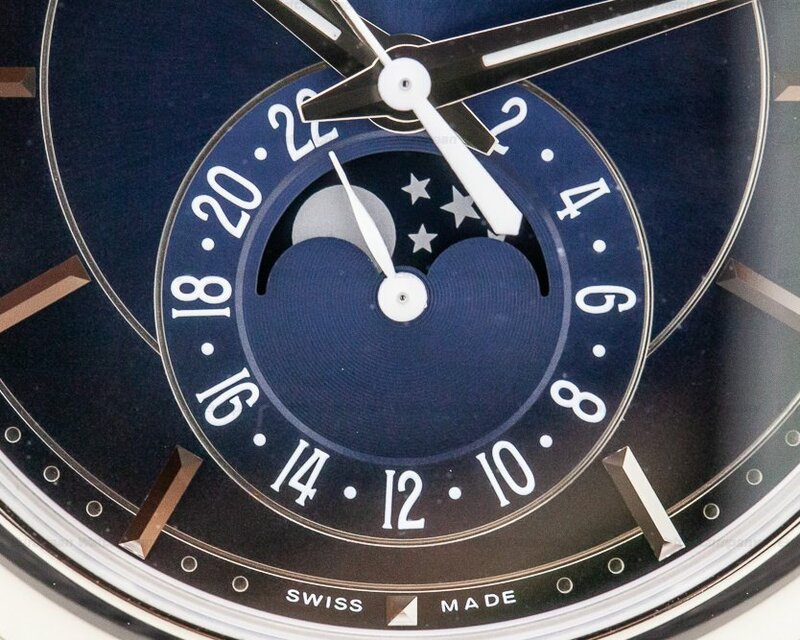 The 13.55mm thick case, dial, and movement are all signed. 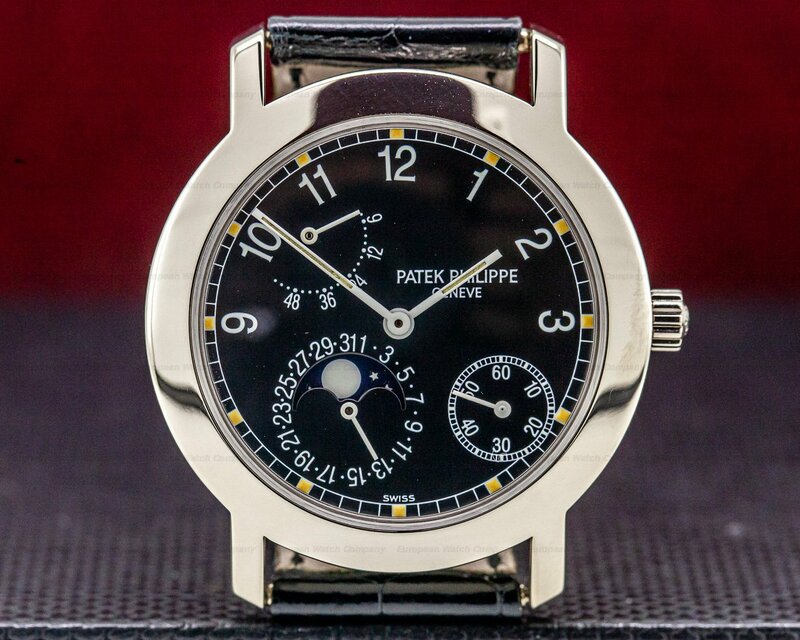 This Patek Philippe Annual Calendar 5205G-013 has a mechanical automatic self-winding Patek Philippe caliber 324 S QA LU 24H/206 (based on their caliber 324 SC) movement. 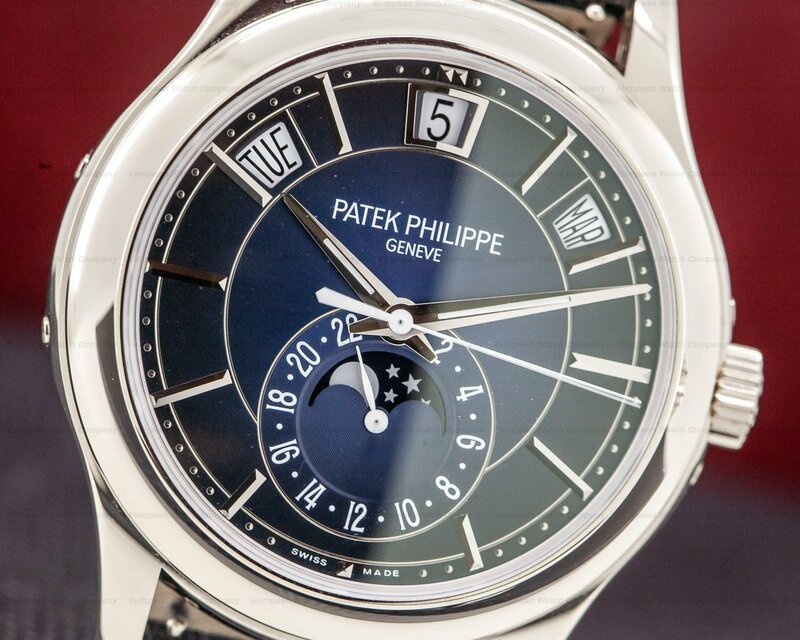 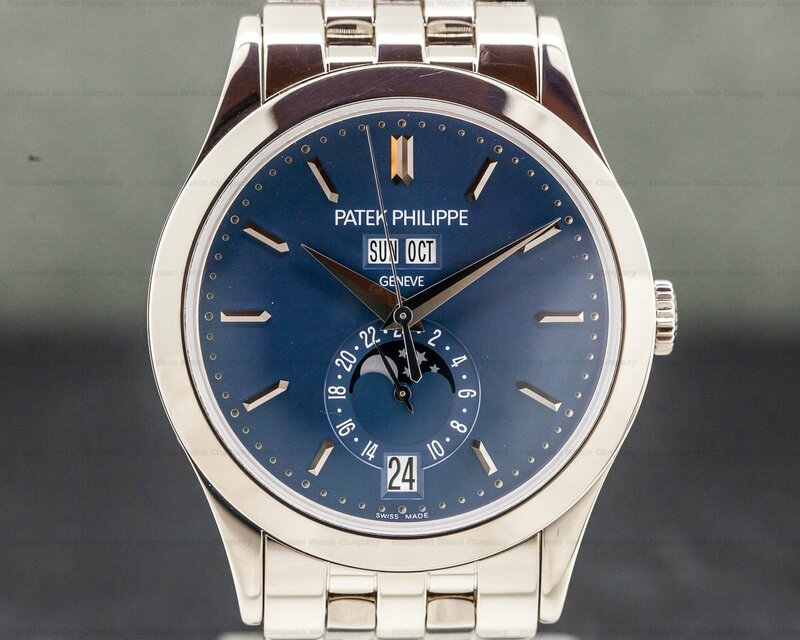 It's rhodium-plated with oeil-de-perdrix and fausses cotes embellishment, and the Patek Philippe seal. 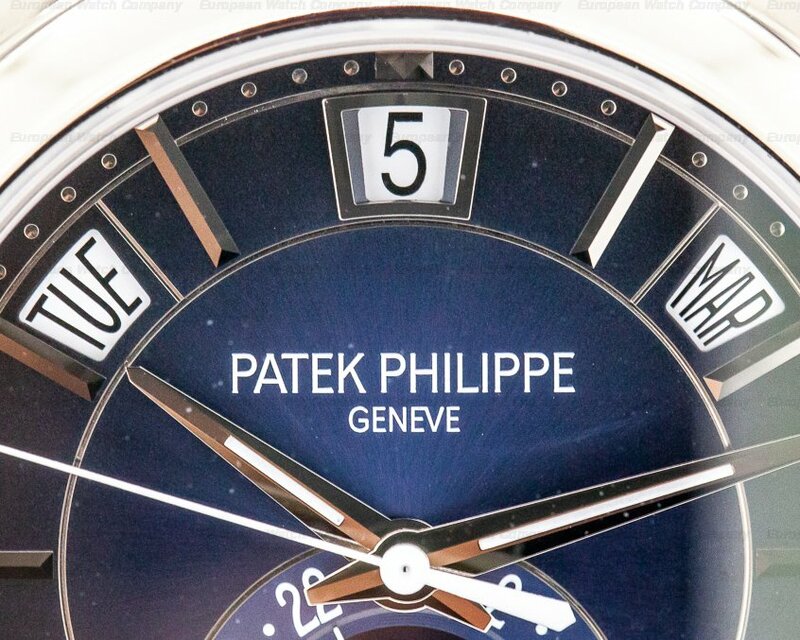 It's constructed with 34 jewels, 356 components, 10 bridges, an index regulator, and a straight-line lever escapement. 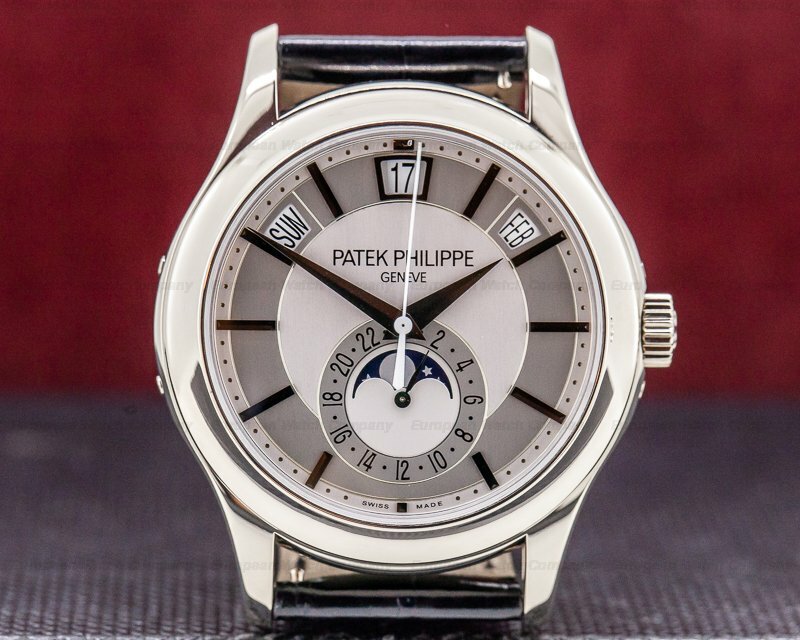 It has the patented Patek Gyromax balance that adjusts to cold, heat, isochronism, and 5 positions, and a 21k gold rotor with the Calatrava symbol. 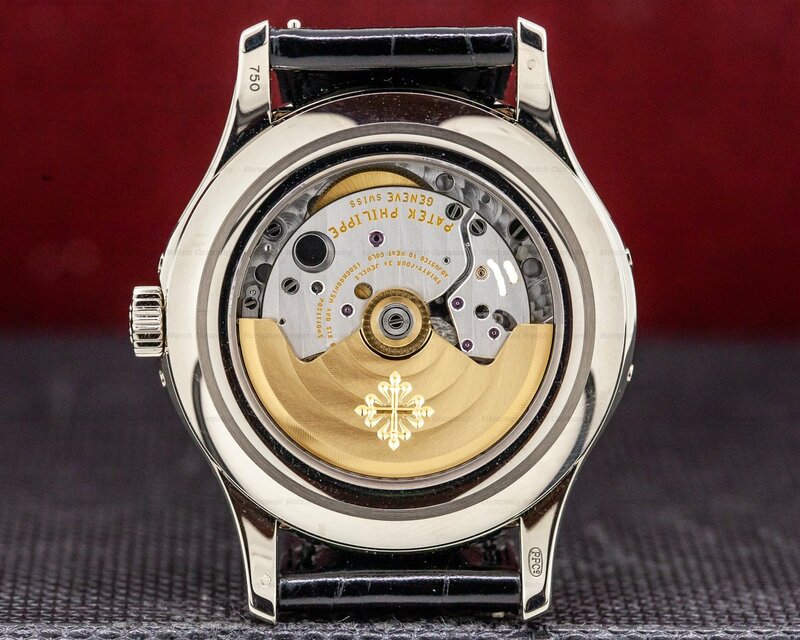 There is a shock absorber mechanism, a self-compensating free-sprung flat Spiromax balance spring, and the mechanism oscillates at 28,800 vph (4 Hz). 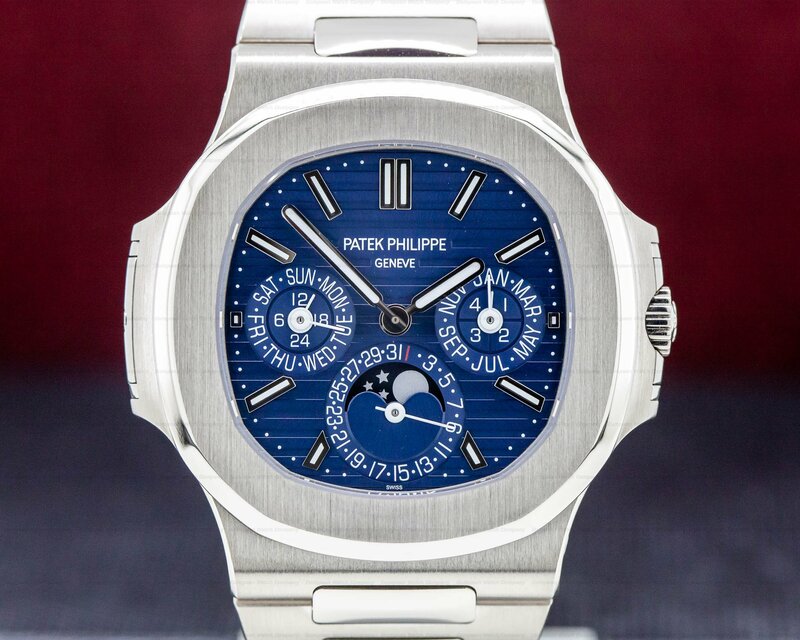 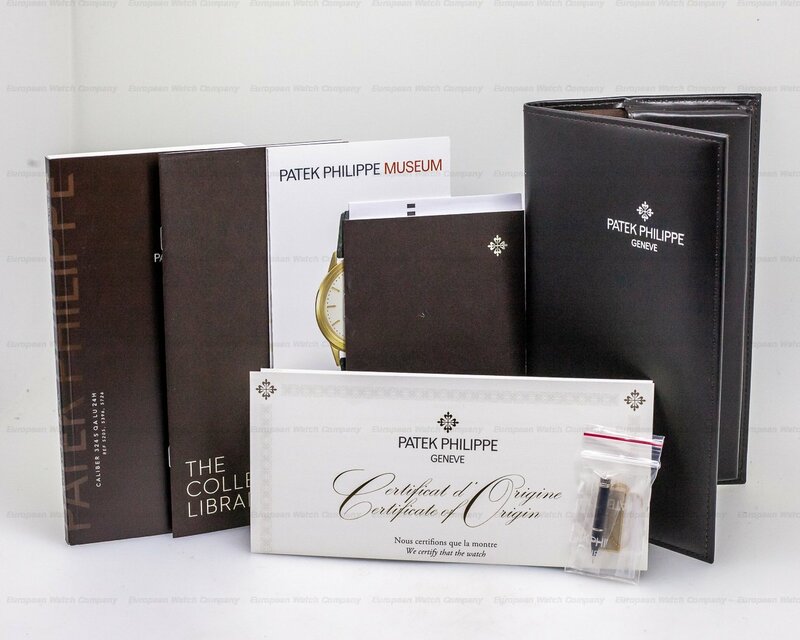 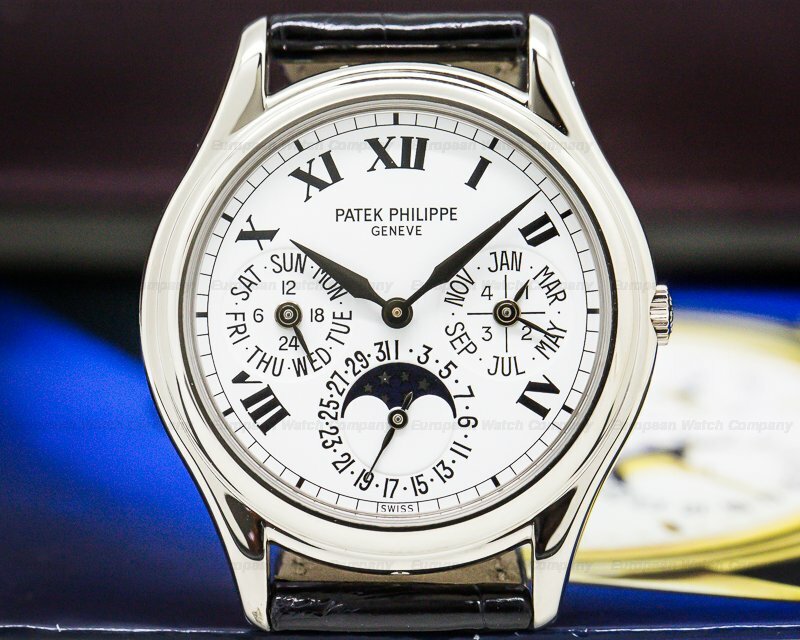 The Patek Philippe Annual Calendar 5205G-013 was introduced in 2018.